Rialto your theater has arrived! One of the first tenants to open in the new Renaissance Marketplace made a big fancy splash last week. They held a series of Friends and Family and VIP openings prior to the official opening to the public on August 16th. Everyone was amazed to see the finished product that had been in the works for more than 4 years! Former Councilwoman Lynn Hirtz was the one responsible for securing this keystone portion of the new Renaissance Marketplace. In a phone interview former Councilwoman Lynn Hirtz said “she was happy to see the new theater come to reality and she couldn’t wait to enjoy a movie here at home in what she has heard is such a beautiful finished product”. Other notable dignitary’s that shared with us their excitment over the new center were Community College Board Member Joseph Williams. Mr Williams was “excited to see so much buzz about things happening in Rialto. There are good people here in Rialto looking for a place to have fun and enjoy life and I am glad to see this development provide that”. Another person excited to see the new theater was former Assembly Member Carter. Mrs Carter was “amazed at how beautiful they made the theater and really worked hard to integrate some of the local flair into the building”. One common thread in everyone’s minds is that this theater is amazing! XD Sound Theaters – These theaters rain sound all around you as you are immersed in the most inclusive sound experience ever imagined as well as larger screens. DBOX seats – These DBOX seats bring you into the action with motion activated seats where you can control the intensity level. Luxury Seats – Every seat in the theater is a soft reclining seat with heat warmers and a swivel tray for all of your snacks. Inside Restaurant – The inside of this theater is more than popcorn and soda they offer Pizza Hut pizza, Hagen Daz ice cream, Starbucks Coffee, Alcohol and Restaurant with a full menu! 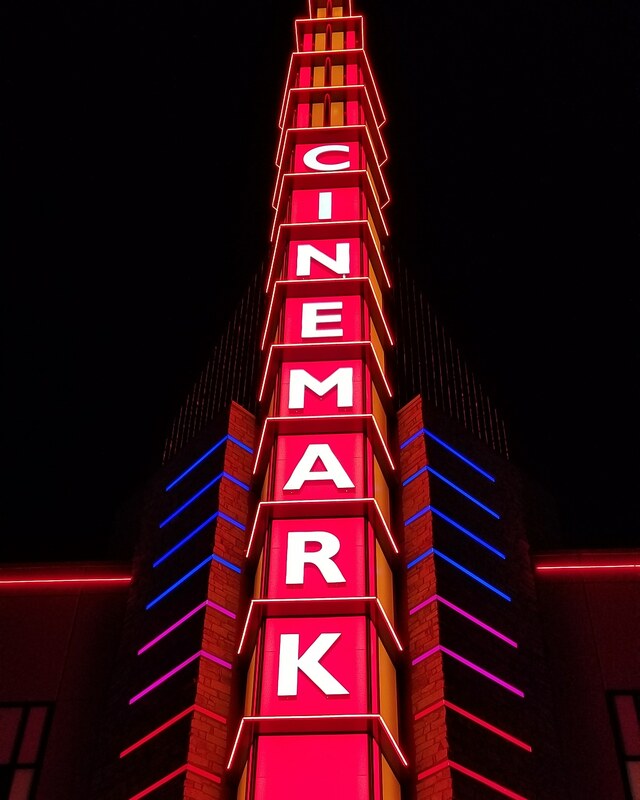 Moviegoers can sign up for Cinemark Movie Club, a unique monthly movie membership program offering ticket and concession discounts along with other exclusive benefits for $8.99 per month. Movie lovers can instantly join and begin taking advantage of their benefits at all Cinemark locations by downloading the Cinemark app or by visiting cinemark.com/movieclub. After touring this newest icon to hit the landscape it is clear that Rialto will do to other cities what has been happening to Rialto. This theater has the potential to pull people from neighboring cities especially Fontana. Rialto has gone from dirt lots, to construction noise and finally new stores opening in Rialto. We have already seen Five Below & 24 Hour Fitness open up and now things are really going to kick into high gear. This week we saw WSS & Coffee Bean open up and the next couple months there will be a flood of new businesses opening coupled with your normal events that happen all year long. 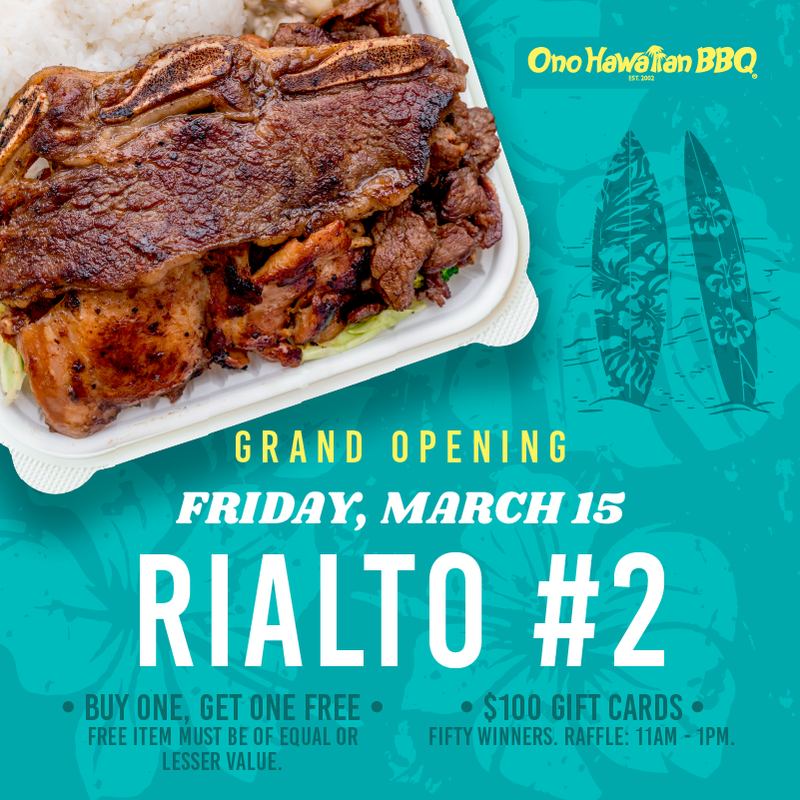 If you can make it you should check out as many of these Grand Openings as possible so you can learn about all the new stuff coming to Rialto. 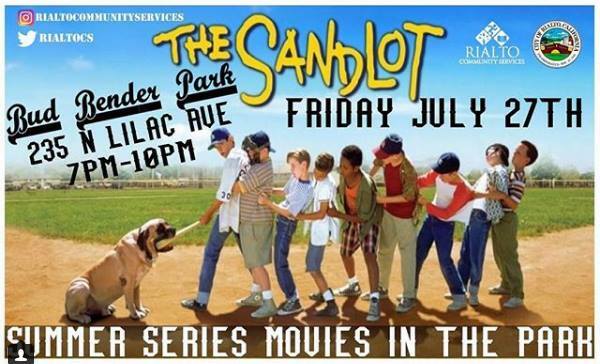 Also don’t forget about the last Movie night being held at Bud Bender park! Blankets, jackets, and lawn chairs are suggested. 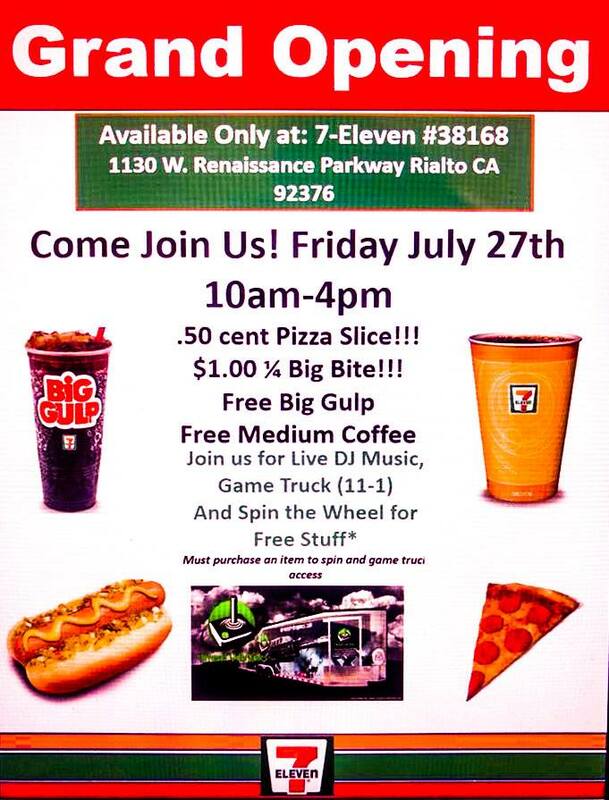 Grand Opening of 7-Eleven at Renaissance Marketplace 1130 W. Renaissance Parkway, Rialto. This Friday, July 27 from 10 am – 4 pm. 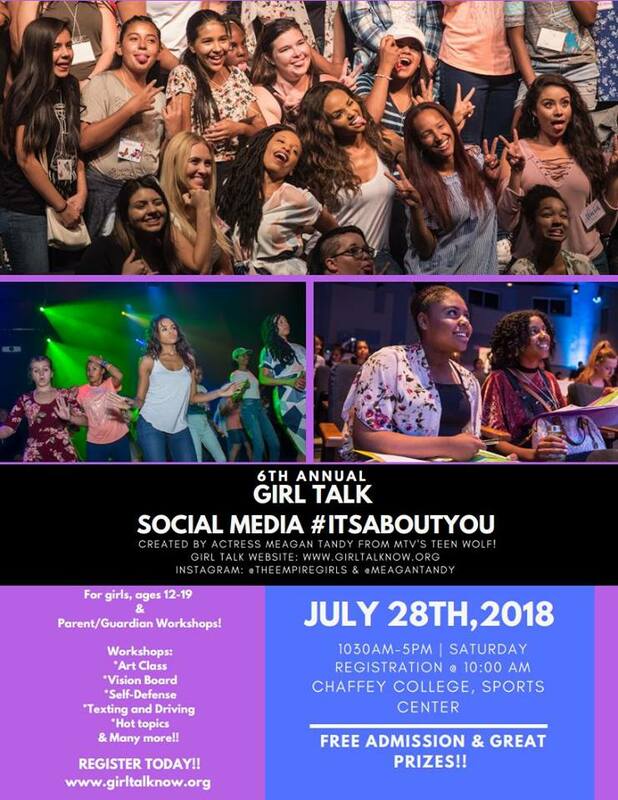 The City of Rialto will be taking some of the young ladies (ages 12-19) of the community on a field trip to the 6th Annual Girl Talk Conference. The theme of this year’s conference is Social Media, and the correlating hashtag is #ITSABOUTYOU. The conference will hold special workshops on various topics, including: art class, vision board/goal setting, self-defense, texting and driving, self-esteem, and more. The conference, transportation, lunch, and a snack are FREE. Registration is limited to the first 20 young ladies who register. 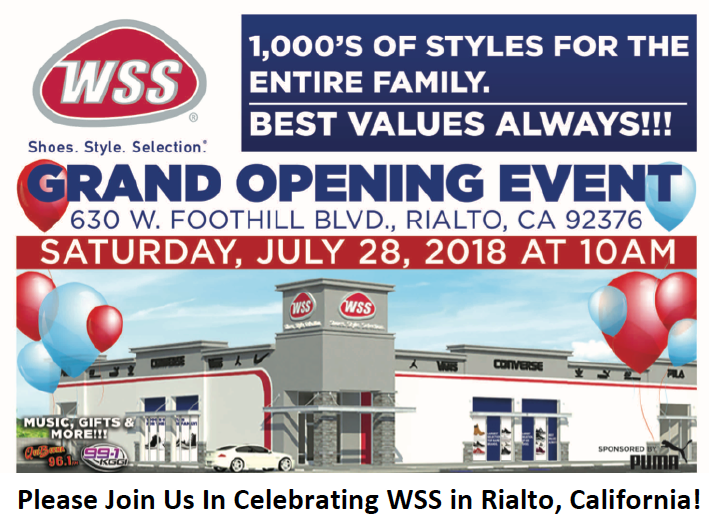 Please Join Us In Celebrating the new WSS in Rialto, California! There will be music, free haircuts, refreshments, giveaways and more throughout the entire day! 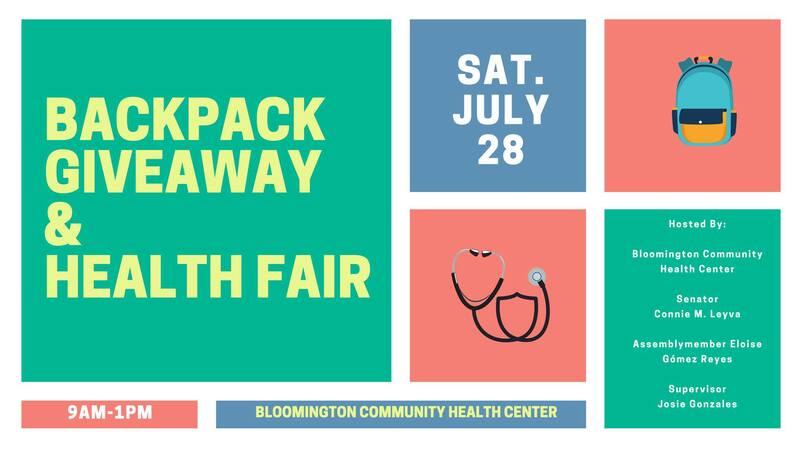 This community event will feature free health screenings, resources, and backpacks until supplies last! Join us. You won’t want to miss out! Here at Rialto Now our Moto is “Informing the public one post at a time”. Campaign signs can’t tell you about a persons character really it is only an indicator of how much money they have because signs are EXPENSIVE!!!!!! With that being said each candidate has been given opportunities to have an interview published with our informational blog/website. Please read the questions and answers below and get more informed about this school board race. Full disclosure this is a Special Election for a seat that will be up for grabs again in November 2018. Give us some background on the history behind this school board election? Late last year a serving Board Member was elected to Fontana City Council leaving a vacancy on Fontana Unified School District’s School Board. The four remaining Board Members implemented a thorough interview process to fill the vacancy and I was one of the finalist. However, at the end of this process the Board was deadlocked and chose to fill the vacant seat by holding a special election. While it has been a journey filled with many obstacles I promised my children – all students at FUSD schools – that I wouldn’t stop until I was in a position to help lead the District and ensure that they and their classmates are receiving the quality education they so richly deserve. What do you think makes you the best choice for voters in November? I’m a life-long Fontana resident and a product of FUSD. My wife and I chose to raise our children in Fontana and send them to the same FUSD schools I attended when I was their age. However, I’m running for School Board in order to ensure that the education our students receive is better than the one I did and that they have more opportunities than I did. As a member of the Fontana Planning Commission and Chairman of the San Bernardino County Committee on School District Organization, I have experienced leading deliberative bodies through building consensus among my peers. That is the leadership that FUSD’s Board needs now, more than ever, in order to craft excellent public policy that enhances educational equity, improves special education programming, and keeps our students safe. Many believe that school board seats should be more about what is good for the school and not ties to a particular political agenda. What are your thoughts on this. Politics must begin to take a back seat to education in our community. Too often representatives elected by the people to do what is best for them and our students end-up placing their own interests – including the potential trajectory of their political careers first. Earlier this year, I drove to Sacramento twice to testify in front of Senate Education and Public Safety committees about legislation our community desperately needed to safeguard our children from child predators — the legislation earned bipartisan support in both committees. I also joined a local non-profit to testify in front of the State Board of Education to advocate for equity and stronger accountability measures for our school districts – specifically low-income students, English learners, students with disabilities, and other racial and ethnic groups. A lot of attention has been given to this election should be about the kids. What are your thoughts on this. As a parent, all I think about is creating better opportunities for children within my community– I grew up here, I live here, and want all of our children to be successful. This is why one of my priorities is advocating for social and emotional learning programs, to effectively help our children apply the knowledge, attitudes, and skills necessary to understand and manage their emotions, set and achieve positive goals, feel and show empathy for others, establish and maintain positive relationships, and make responsible decisions. This was my focus when I helped establish the WATCH DOGS program at my son’s middle school. With most budgets at max capacity how vital are public/private partnerships to provide more for Fontana students? As a school district, public and private partnerships are critical to improving learning conditions and environments for students. In fact, this is something I was able to accomplish when I was in charge of federal and state grants that provided financial literacy, nutrition education, and healthcare access to families. What can you bring to the table for parents that a skeptical that anyone on the school board or in district office are being wise stewards of Fontana tax fillers? I want students, parents, community members, and business owners to be more involved in the decision-making process. As a Board Member, I will be fully accessible and open to new ideas to not only engage, but include recommendations to how we can operate more efficiently and be better accountable. How vital is it to you that local business owners step out and help train tomorrow’s innovators and business owners? How have you stepped up and put words into actions? I think it is incredibly important that we expose our youth, at an earlier age, to the idea of attending college, seeking a trade, or business ownership to help create a plan for them. This is vital to economic development in our community and I want our children to help drive that. Too often, we have only exposed our children to certain industries, but the jobs of tomorrow have yet to be created. 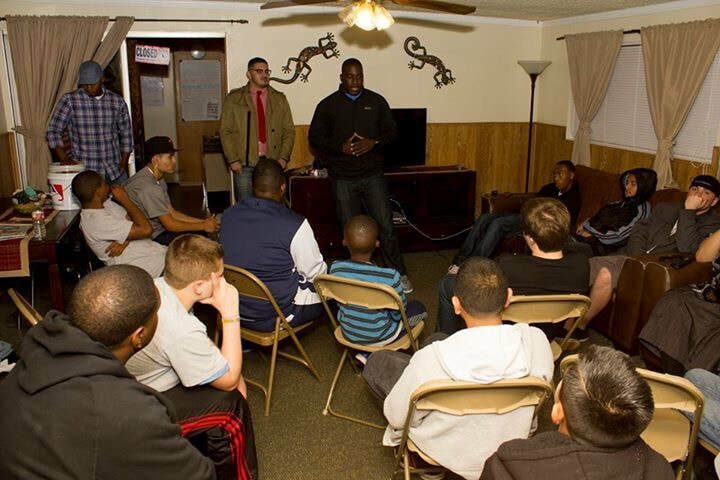 Our children need exposure, which is why when I developed after-school programs, I placed an emphasis on bringing different careers and backgrounds to inspire students. 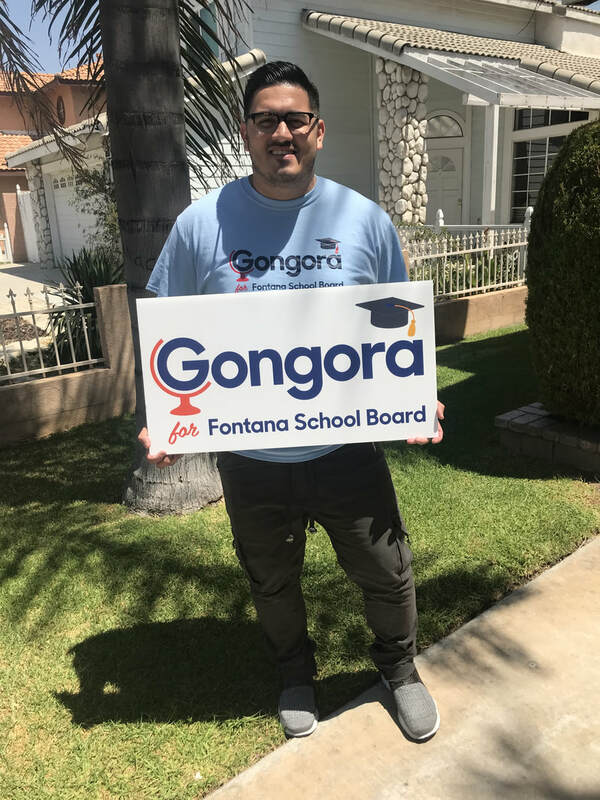 In fact, one of my biggest accomplishments is organizing Fontana graduates to come back and mentor students in the school district through Fontana Foundation of Hope, Big Brothers Big Sisters Inland Empire, and the Fontana Unified School District. My next project will be providing access to high school juniors and seniors with internships at local businesses. I work in human resources for the tenth largest county in the United States and I want students to be prepared to fill these positions. Whoever you pick in November as your person for Fontana School Board I can tell you that when it comes to political ideals Kareem and I are miles apart. Yet he is approachable, willing to sit down and hash out ideas and even come under harsh digital attack and scrutiny. Yet this man remains willing to help and listen. Every year both Kareem and I go to a local continuation school to talk to kids that struggle with life choices and their education about the opportunities before them. School board elections should not be about political affiliation they should be about people that are ready to get their hands dirty and work hard for students and parents.